Ray Chavez would not talk about the attack for decades. He suffered from post-traumatic stress disorder that left him anxious and shaking. 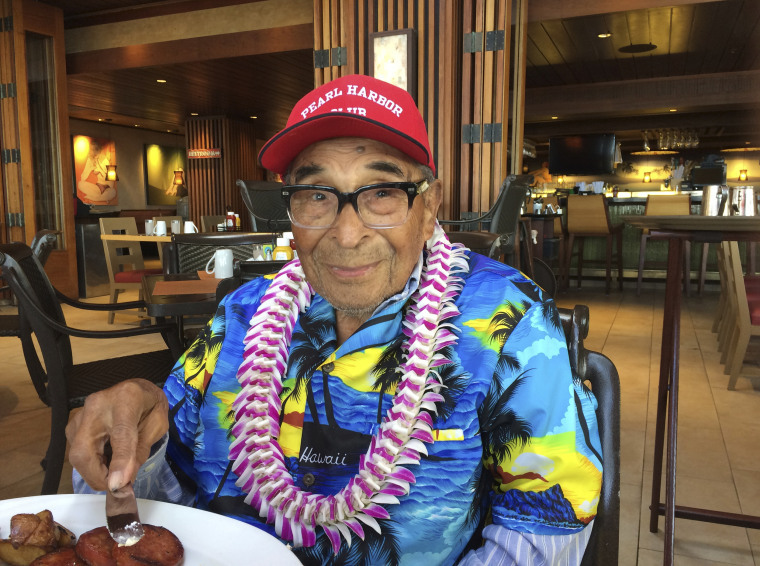 LOS ANGELES — Ray Chavez, the oldest U.S. military survivor of the Dec. 7, 1941, attack on Pearl Harbor that plunged the United States into World War II, died Wednesday. He was 106. As recently as last May he had traveled to Washington, D.C., where he was honored on Memorial Day by President Donald Trump. The White House tweeted a statement after his death: "We were honored to host him at the White House earlier this year. Thank you for your service to our great nation, Ray!" "I still feel a loss," Chavez said during 2016 ceremonies marking the attack's 75th anniversary. "We were all together. We were friends and brothers. I feel close to all of them." Hours before the attack, he was aboard the minesweeper USS Condor as it patrolled the harbor's east entrance when he and others saw the periscope of a Japanese submarine. They notified a destroyer that sunk it shortly before Japanese bombers arrived to strafe the harbor. "It seemed like I only slept about 10 minutes when she called me and said, 'We're being attacked,' " he recalled in 2016. "And I said, 'Who is going to attack us?' "
"She said, 'The Japanese are here, and they're attacking everything.' "
Chavez would spend the next week there, working around the clock sifting through the destruction that had crippled the U.S. Navy's Pacific fleet. Although never wounded, he left the military in 1945, suffering from post-traumatic stress disorder that left him anxious and shaking. "He loved trees and he dearly loved plants and he knew everything about a plant or tree that you could possibly want to know," his daughter said Wednesday with a chuckle. "And he finally retired when he was 95." Still, he would not talk about Pearl Harbor for decades. Then, on a last-minute whim, he decided to return to Hawaii in 1991 for ceremonies marking the attack's 50th anniversary. "Then we did the 55th, the 60th, the 65th and the 70th, and from then on we went to every one," his daughter recalled, adding that until Chavez's health began to fail he had planned to attend this year's gathering next month. In his later years, as he became well-known as the attack's oldest military survivor, he'd be approached at memorial services and other events and asked for his autograph or to pose for pictures. He always maintained that those events were not about him, however, but about those who gave their lives. "He'd just shrug his shoulders and shake his head and say, 'I was just doing my job,'" said his daughter. "He was just a very nice, quiet man. He never hollered about anything, and he was always pleasant to everybody." Chavez was preceded in death by his wife, Margaret. His daughter is his only survivor. Funeral services were pending.